Alright! The Mumbai IndiBlogger Meet is now on maximum capacity. We cannot wait to be there and chat with all of you again. The chance of meeting bloggers in your neighborhood is a treasured opportunity as these events are rare and are quite expensive to organize. We all hope that you can make some friends, talk about your blogging and do what you do best, Blog! Blog! Blog! If you have not visited the meeting page recently, please do as there have been some updates to the agenda and the Meet itself. Hotel Sea Princess is going to be in-charge of the hospitality for the IndiBlogger meet and they did mention that there could be a surprise or two :). 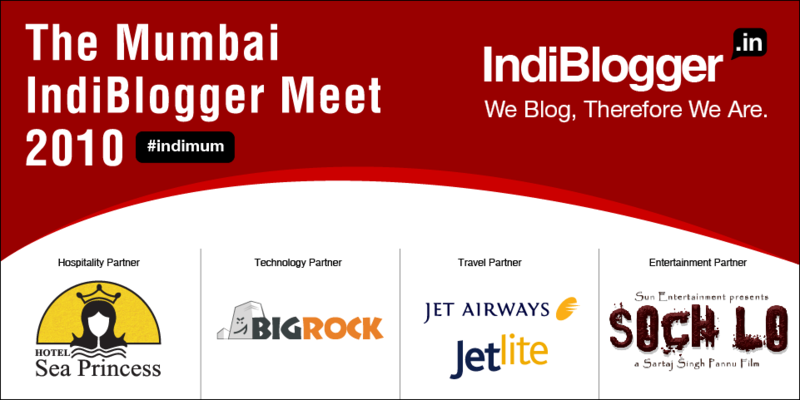 Jet Airways has done a fair share in getting this blogger meet organized and thanks to them, this meet should start on time with fewer missing IndiBlogger’s. BigRock is our technology partner and did we hear them say that everyone gets their own .in domain?? The Hewlett Packard Imaging and Printing group will be in the house and they will launch their new IndiVine Channel for Technology blog posts. The Soch Lo contest on IndiVine has brought a lot of very personal experiences to light and they will be here in Mumbai as well. Overall, there should be something that everyone can take home during this blogger meet, however, our organizational skills have been compared to a ballet dancing cat on steroids. So, anything can happen :). Surprises at the venue! can’t wait to see what it is going to be. I know you folks have put in a lot of time in putting things in an order. Wish you all the best folks.. see you all there. It’s a shame that I am not in Mumbai and hence unable to attend this meet, nevertheless, I will be looking for updates on this very closely! Good luck folks! U guys rock!